Welcome to the 2018 CarterMatt Awards! This is our seventh annual year-end series where we as a site celebrate some of the best that TV has to offer! Our staff collectively hand-picks nominees across a wide array of different fields, and then leaves it up to you to declare the winner. We’ve had a fun time over the years with these awards and creating some fun debate throughout the month of December. Hopefully, this time around is no exception! 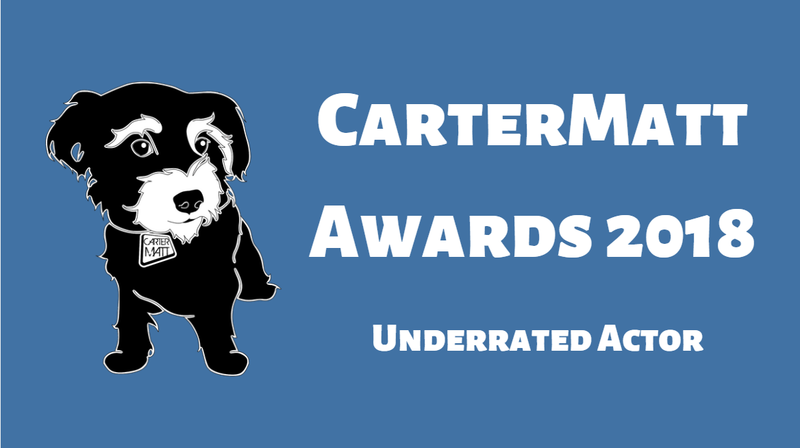 Today we’re discussing Underrated Actor— this is a category that we have featured in the CarterMatt Awards for years, and what we love about it is that it affords us the opportunity to celebrate people who are often under the radar for one reason or another. These are people who have given us some outstanding performances, but for whatever reason, don’t get the awards love that they deserve. That’s the only criteria we have here — none of our picks have been nominated for an Emmy or a Golden Globe over the past twelve months. Voting rules – Vote however often you’d like! If you are having issues with voting, a handy guide can be found later on in this article. When does voting close? – On Saturday, December 29 at 1:00 p.m. Pacific time. The results for this category will be announced shortly after. 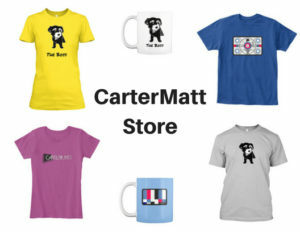 To check out more categories and nominations for the 2018 CarterMatt Awards, check out the official landing page. John Bell, Outlander – There are times in which Bell’s Young Ian Murray exists on the Starz drama as a fantastic source of comic relief, but we personally know him to be so much more than that. This is a young man who is in the process of trying to figure out who he is in a new place, away from his biological parents, and also still recovering from some pretty horrific trauma that he suffered last season. Bell balances out the material with the right amount of range and commitment — Young Ian is a character that makes you smile, but there is also a greater emotional undercurrent there that he ensures you never forget about. His enduring sense of adventure and passion is something that so many of us as viewers can admire. Matthew Daddario, Shadowhunters – Speaking of passion, Daddario deserves a tremendous amount of praise for being able to shape and mold the character of Alec Lightwood over the past three seasons. He’s the sum of so many different things: A valuable asset in the battle against evil, a loyal brother, and the love of Magnus Bane’s life. Daddario was able to channel some of the character’s pain and struggle, but also still able to find the lightness in what were at times little moments — whether it be in his friendship with Jace or at home with Magnus, somehow finding a moment of normalcy amidst the surrounding chaos of his life. Daddario brought everything to this role that you could hope for. Will Estes, Blue Bloods – Has this been the biggest season of Blue Bloods yet for Estes? It feels that way, mostly in that we’re finally getting a chance to dive into the ins and outs of Jamie and Eddie as an engaged couple. 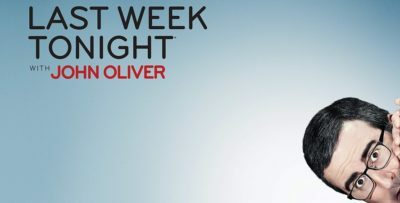 This has enabled us to see a more personal side of Jamie as he tows the line between his personal relationship to his fiancee and their ever-complicated professional relationship. Having Jamie become a Sergeant this season was another fantastic way to spice up the role, and we’ve appreciated seeing the moral gravity that he has brought to it this season. There are so many layers and dimensions than we’ve ever seen and he really deserves some recognition for what he’s brought to the role. Jason George, Station 19 – In speaking here of layers of dimensions, George had one of the biggest challenges out of anyone in 2018 — he had to transition over from Grey’s Anatomy to Station 19 and beyond just that, had to help his character Ben Warren also transition jobs. This was a challenging year for George as an actor as he took on the commitments of a TV firefighter, while also still keeping the same attributes of the Ben that we know and love. It’s not easy for an actor to help anchor a new show while also playing a familiar character, but Jason pulled that off while delivering both action-packed and heartfelt scenes in the process. Daniel Henney, Criminal Minds – On a show like Criminal Minds, you often have to take advantage of your opportunities given that for many cast members, you’re lucky to get two or three personal storylines a season. For Henney this year, he absolutely made the most of his time. One such example came last year in “Ex Parte,” where Matt Simmons had to desperately find a way to help his wife Kristy through a life-or-death situation. It was there we saw Simmons’ devotion as a husband alongside his strength as a BAU member. Meanwhile, in “Rule 34” you had a chance to see more of Simmons the father as he took on a personal situation separate from work with his son and the after effects of what happened to his wife. Henney has shown that he can tackle a wide array of material, making Simmons both the action hero and family man that many can relate to. Eric Christian Olsen, NCIS: Los Angeles – Olsen is another one of those actors who, throughout the past year, has been counted on to do almost everything. Think in terms of his dramatic, heart-wrenching scenes with Daniela Ruah at the end of season 9 where it felt like Deeks and Kensi’s relationship was on the verge of collapse. Watch Olsen’s performance there in contrast to some of the lighthearted, fun stuff that he’s gotten to do in opening his bar. This is a guy who is capable of taking on almost anything the writers throw at him, and 2018 is a perfect example of why Marty Deeks is one of television’s most likable, relatable characters. He’s flawed, but he doesn’t let these flaws get in the way of the person that he is or what he wants out of life. Matt Ryan, Legends of Tomorrow – Admittedly when Ryan first joined the CW series as a regular for season 4, we didn’t know quite how it would work. Legends of Tomorrow is a show that does rely on wacky humor and at times a super-vivid imagination, and on occasion it doesn’t feel like that would mesh with a pretty dark DC Comics figure in John Constantine. Yet, Ryan has found a way to brilliantly tow the line adapting to this world while also not changing the Constantine character. You see the tortured-soul elements, while also getting to see and understand more of who John is away from tackling demons. He can also still crack a witty joke with the best of them. Aidan Turner, Poldark – Finally, we turn to the star of the BBC / PBS series and a man who has proven himself, time and time again, to be a master of taking on different roles within this world. Ross has served as a soldier, a conflicted hero, a husband, a fighter, a politician, and so much more through four seasons. This past one may have been one of his most challenging given that he had to find a way to rebuild his character’s relationship with Demelza while fighting a complicated political war for Cornwall in London … and that’s without even mentioning the physical battle that he undertook with Monk Adderley at one point. Turner remains for this show the man who can do it all. Happy voting! As we mentioned, be sure to head over to the link here to check out our landing page with other categories.